Fresh & Light Quick Action scented multi-cat scoop cat litter absorbs tough odors and clumps hard faster to make life with multiple cats sweeter. Its 99% dust free formula makes cleanups a breeze. Plus, it’s up to 25% lighter than leading clay scoopable brands, but with the same number of uses*. Fresh & Light Quick Action is rated 4.6 out of 5 by 195. Rated 5 out of 5 by Travelin cat from Best litter for our travels We use quick action Fresh & Light when we are traveling with our cat. In the small area of a fifth wheel trailer quick order control and low tracking are HIGH priorities. This is the best we have found and we have tried 10+ different kinds. Also the plastic jug makes litter storage easy on the road. I do wish Walmart still had this in the stores but sadly I can only find it online now. Rated 5 out of 5 by Kitty Cat from Great litter This litter clumps good and lightweight easy to use litter. 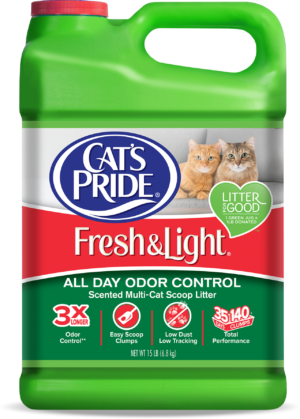 Rated 5 out of 5 by Theresa173 from Love the light weight products I have switched to the Cat's Pride Light weight products and with 4 cats it is much easier. Rated 5 out of 5 by NorbieB from Fresh & Light Ultimate Care NOT dust free! I agree with Ruth29. Your new product, Ultimate Care, which I had to buy because the Quick Action was not available, is inferior to the Quick Action! I also had to buy the gray lid kind and it is extremely dusty, which goes against one of your claims of being dust free. My black cat comes out gray and there is always dust all over the house. I have to breathe it in to change the litter and what is it doing to my cats? The Quick Action IS 99% dust free and excellent, why did you change it. If I can not find the Quick Action litter I will go to another brand after using yours for over 3 years. Rated 5 out of 5 by Francine from This litter is A LOT easier to handle PLUS... I was struggling with carrying heavy litter from the store to my car and into my home until finding out about this lightweight litter from my daughter. This litter is A LOT easier to handle PLUS it blocks the bad odors AND Francine looks happy using it! Rated 5 out of 5 by LadyGator8675 from Great Litter I have used Cat's Pride for many years and am very satisfied. I have four cats (with six litter boxes) as well as an additional box in the garage for the neighbor's two outside cats who like to visit. All of them like it and no one ever smells the litters. I scoop them frequently, but the product helps control any odor. I am also pleased that Cat's Pride is made in the U.S. Rated 5 out of 5 by Karren from Love this product! I have been buying this product for a while now and really, really like it a lot. How can this be light weight and low tracking? Tracking is my big issue. Yes, we understand that tracking can be problem. Our lightweight litters have granules that are treated to minimize dust and tracking. We continue to work on these areas of concern and expect to improve soon. 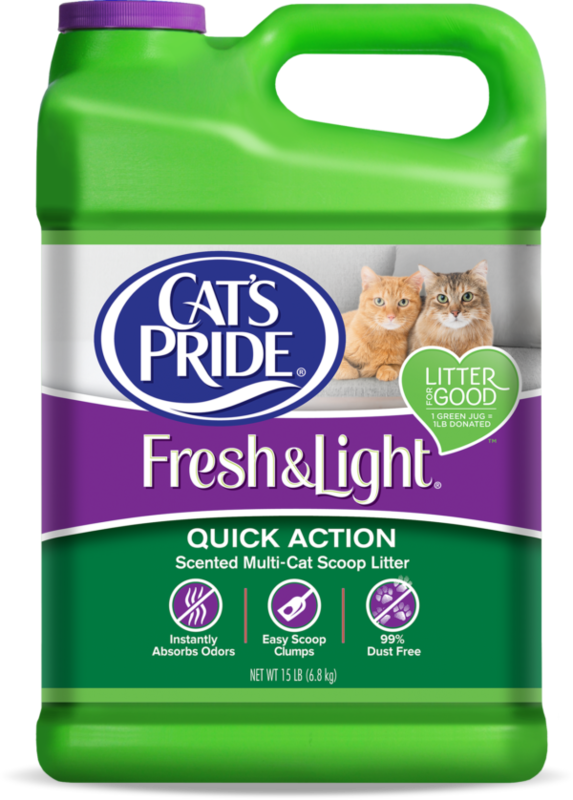 Are you discontinuing Cat's Pride Fresh &amp; Light Quick Action Scented Multi-Cat Scoopable Cat Litter, 15-lb jug? If so, why? No. Please ask your local retailer about ordering or special ordering Fresh &amp; Light&reg; Quick Action Scoop. 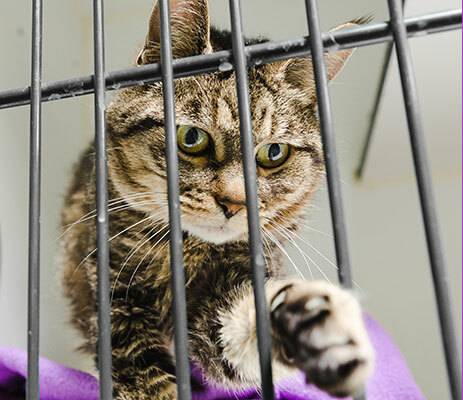 Also, please visit our &quot;store locator&quot; found on our website: www.catspride.com or call our consumer hotline for personal assistance to find this product ( Call : 1-800-645-3741 ). Thank you for your question and continued support!! Is this product safe for rabbit litter box.? Does it have a coconut scent? What makes this litter 99%dust free?&nbsp; It seems pretty dusty. We are very sorry to hear that a recent package of our litter offered excessive dust. Normally, our litters are low dust (or 99% dust free) due to an advanced dust control process applied on the litter during production. Please contact our consumer relations 1-800-645-3741 for immediate assistance. We wish to learn more about your experience, obtain code and lot numbers, as well as provide you with replacement coupons and/or a refund. We hope to hear from you very soon !!! Why did the price on your Fresh and Light purple top litter go up almost 300% in price when I can find it? It was perfect for our multi cat household. Your newer 40 and 50% lighter litters cause much more dust and the cats track more of it. I can't find Quick Action anywhere. I would always get it at Walmart or Wegmans. I have not seen it for weeks. Is the product discontinued? We are unable to find this product at out local Walmart anylonger(Indian Trail, NC) any ideas as to why? We greatly appreciate your feedback. Presently some Wal-Marts have discontinued this product. We are working hard to regain distribution. Please consider our Cat's Pride&reg; Fresh &amp; Light&reg; Ultimate Care sold at Wal-mart or shop for Cat's Pride&reg; Fresh &amp; Light&reg; Quick Action at the grocery store retailers in your area. If you have further questions or wish to receive coupons, please contact our consumer relations 1-800-645-3741 for immediate, direct assistance. Your continued support of Cat's Pride&reg; is very important to us!